First introduced in watchOS 3.2, Theater Mode is a simple but useful feature that's designed to prevent the Apple Watch's screen from activating when you raise your wrist. It's useful in situations where the bright screen can be a distraction, such as a movie or a play, and it's also useful for those who like to sleep with their Apple Watches. Theater Mode is available as an option in the Apple Watch Control Center, so toggling it on and off is simple. Raise your wrist to activate the Apple Watch screen or press the Digital Crown. Swipe up from the bottom of the Apple Watch to bring up Control Center. Swipe up again to access the icon that looks like a pair of theater masks. A screen will pop up explaining theater mode. Tap again to activate it. While Theater Mode is active, you'll see an the icon at the top of the Apple Watch whenever you view the screen. To turn it off, open up the Control Center again and tap the Theater Mode button. When Theater Mode is enabled, the screen will remain dark when you raise your wrist instead of lighting up. It will also stay dark when a notification is received, but you'll still know if you get an incoming text or other alert because haptic feedback remains on. You'll continue to get a tap whenever there's an incoming notification when Theater Mode is turned on, and to view it, you'll need to press the Digital Crown or tap on the screen. 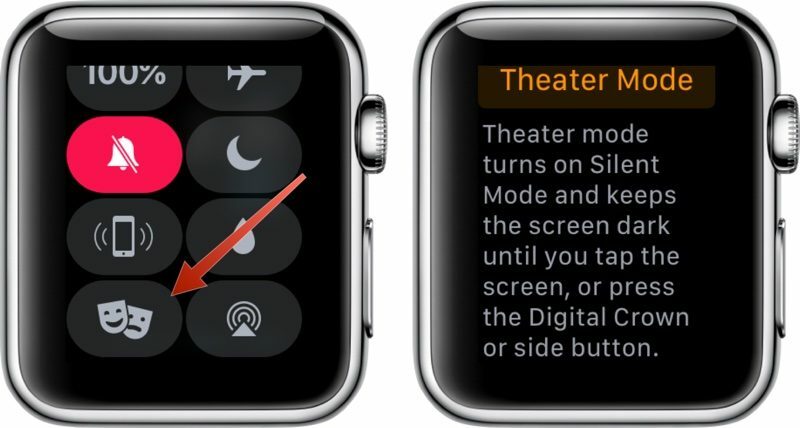 Tapping, pressing the Digital Crown, or pressing the side button is also how you check the time when Theater Mode is enabled. Do not disturb still exist and it's different than this mode. When you activate do not disturb notifications will be stopped until it's off. Theater mode will not stop your watch to vibrate for notifications, but it will not turn on the screen by your wrist movement and notifications. Not only that, it will also put your watch on mute and then un-mute when turning off theater mode. Very handy. I can't tell you how many times I look at my watch when at a movie when I feel a vibration, even accidentally. Then I have to quickly hide the screen under my shirt to prevent it from bothering others. Good, now I won't get beat up in theaters any more. This is a great feature, should have been in from the start I think, but better late than never. [....] and it's also useful for those who like to sleep with their Apple Watches. I'm happy about this feature. It's not just the movies where I don't need my watch to light up. For me, I always had raise to wake deactivated. Either I press the digital crown or tap the screen to wake it up. Even though I see the point of theater mode, it wouldn't make much of a difference to me with the display lighting up, being I always had that deactivated. I do certainly think this is more of a shortcut and a quicker option at that. Your post is worded awkwardly. I'm not following your post here CDM. Essentially, raise to wake and silent mode are invoked with Theatre Mode, versus having to dabble through settings to disable Raise to wake. It's merely a short cut, with a new feature from the home screen. Why call it "theater mode" instead of "don't disturb" mode? "Theater mode" sounds very ridiculous for such a small display! Thanks, I found it after I did a quick Google search. This might be useful as a "meeting mode" toggle - we'll have to see. If you work a job that causes the screen to come on all the time unintentionally (e.g. Work on a checkout) this could give you loads of battery life back.